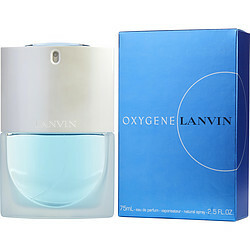 Oxygene by Lanvin is a fresh women's perfume that will put a new spin on your day. Featuring refreshing gardenia and iris balanced with powdery musk and sandalwood, this perfume is soft, familiar, and complex, so you'll appreciate it more and more with each use. Introduced in 2000, Oxygene is a perfume that will linger on your skin and in your thoughts at work, lunch, or home. A gentle application to your wrists leaves you with a touch of long-lasting fragrance that will energize you as the day goes on.